Ashfield Hostel i Dublin, Irland : Boka nu! 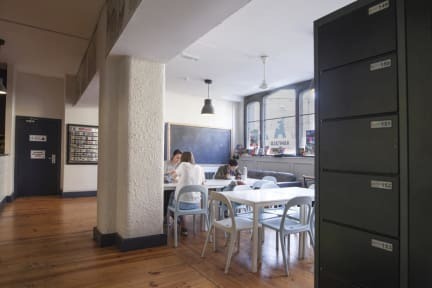 Abigails Hostel requires 48 hours’ notice to cancel a booking or reduce the numbers of a group. Failure to cancel within this time will result in a cancellation charge equal to the first night of your stay. Management and staff reserve the right to cancel a booking and ask guests to leave the premises in the event of any anti-social behaviour. Children under 16 years old cannot sleep in dormitory rooms shared with other guests. Översatt av Ashfield House ligger i hjärtat av Dublin, mellan Trinity College och O'Connell St Våra besökare har sagt detta "utmärkt läge" gör vandrarhemmet en "väldigt behändig liten plats att krascha efter en natt i Temple Bar". Denna "perfekt hem hemifrån" har "vänliga och hjälpsamma" personal som "gå ut ur deras sätt" att hjälpa, plus gratis bagageförvaring, en "läcker och fyllning 'frukost och en' 'äta mig I ' m fritt \ "skåp" i köket. Vi gillar deras dagliga rundvandringar i Dublin. 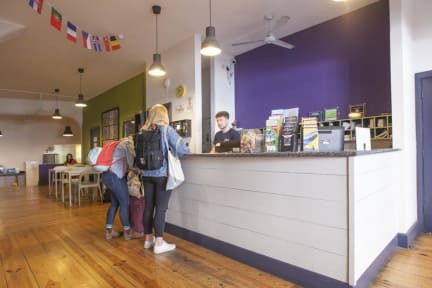 Ashfield Hostel is Dublin's most centrally located hostel. We're just one minute's walk to Trinity College, Temple Bar and O'Connell Street as well as bus stops to the airport, ferry terminal, Guinness Storehouse and Heuston Station. All rooms are ensuite, from private rooms to our multi-bedded rooms. Breakfast is included and consists of cereal, toast, yoghurt, tea, coffee, juice, eggs and fruit. We have free guided walking tours of Dublin city every day, plus a ton of other free stuff, such as free Wi-Fi (lobby and rooms), free luggage storage at reception and free city maps and guides. There's also safety deposit boxes and Internet terminals (small fee), vending machine and a fully-equipped kitchen. We're open 24/7, with check-out time of 10.30am. Please note that children under 16 are not permitted to sleep in shared dorms. 14 night maximum stay. We got so much for our money's worth! The room was clean and the staff made us want to never leave. We will be back! Loved the place. Very good for the price. A little cold, the window couldn’t close. But all around nice and quiet. Amazing staff! Very near everything and price worthy! I'll definitely stay there again. Excelente sitio para una estancia corta, muy buena relación calidad precio. El ambiente muy agradable y acogedor. Repetiría la experiencia.